The Houston Center for Contemporary Craft has a fabulous ‘Hands On’ program the first Saturday of each month. I have tried (and came close to succeeding) volunteering my help for each one this year. The final one for the year was presented by the wonderful and interesting ladies from the Gourd Society. Our project was to make a gourd brooch. We didn’t have a huge crowd this month (everyone out shopping??) 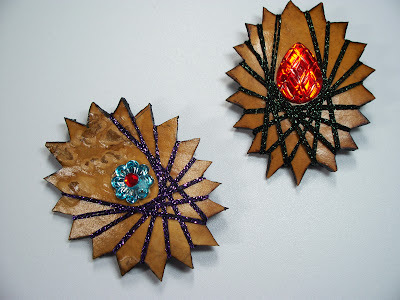 but we had a great time and I think several moms will be receiving one these wonderful brooches. One of the perks in volunteering is that you have to know how to do the project so that you are able to help the folks that come in. Above are my efforts (you do have to make at least one to know how to do it, right?). Don’t you just love those sparkly ‘jewels’? Seriously, it is a great activity for the whole family and I’m eager to find out what the projects will be next year. If you live in the Houston area, do come down on the first Saturday and plan to have fun and learn something new.